This follows Volume 9 Chapter 4. Please click the image to jump to the text, or hover above it. "It's Shakespeare. Macbeth. Ever heard of it?" "Are all these books classics?" It was a letter from Inukashi. He hadn't received one in a while. Shion carefully folded the letter scribbled on rough paper, and put it away. I'm going, Inukashi. Tsukiyo cried at his feet. This mouse had chosen to remain by Shion's side. He was a little older now, but was as energetic and bright as ever. Karan was his absolute favourite person, and he slept in her bed at night. Another letter was from someone Shion had not dreamed of receiving word from. It was from Sasori, the man in the underground realm. A few days ago, Shion had been paid a visit by a sewer rat carrying the letter in its mouth. In it was written a short message of thanks. Following the destruction of the Correctional Facility, the people of the underground realm had fled into the forest on Rou's orders. Promise them a land where they can live in peace. 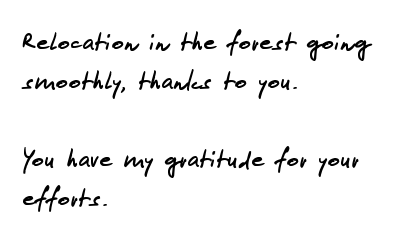 Shion had forwarded Rou's short message to the Restructural Committee, and gotten permission to allocate a part of the northern forest to those people. The land was on the outskirts of Mao, where the Forest People used to live. The dense expanse of forest protected their eyes, which were sensitive to bright sunlight because of the darkness they were accustomed to. Shion had chosen this spot after much deliberation. Rou chose to remain underground. He ended his life there, along with a few elders. The remains of the Correctional Facility have now become a park. Inukashi mentioned that he took Shionn there to play sometimes. Shion got up, and stood by the window. He threw it wide open. Come on in, Nezumi―just like you did that night. Only a breeze, thick with the scent of young leaves, blew at him in return. No. 6―a city by that name once existed here. It had existed, once the epitome of human intelligence, a utopian city-state. Its the same old here. Old man Rikiga is having a ball because the wall is gone and he can go wherever he wants. Now he gets too see your Mum. Be careful. You never know whats gonna happen in life. If that old man somehow ends up becoming your stepfather, thats a tragidy man. Your Mum sent over some apple pie and rolls the other day, to me and my Shionn. They were phenomenol. Tell her thanks. Shionn is going to turn 3 soon (dunno for sure, since I don't know his birthday). Do you think you can help out with dog-washing on your next day off? So I heard your a member of the city's "Restructurell Comittee" or whatever, huh? I feel bad for asking a bigshot like you, but we need good washers. Any way, no matter how big of a bigshot you become, to me you'll always be an airheaded little boy. Hope you can find the time. Font credit to Gabriel De Ioannes Becker for Gabo 4 (Inukashi). Font credit to Levi Szekeres for Lipsum (Sasori).